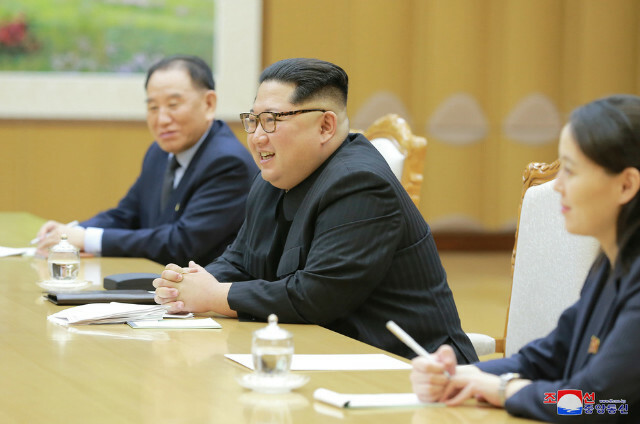 SEOUL (Reuters) – North Korean leader Kim Jong Un told a visiting delegation from South Korea that it is his “firm will to vigorously advance” inter-Korean ties and “write a new history of national reunification,” the North’s official news agency said on Tuesday. “Hearing the intention of President Moon Jae In for a summit from the special envoy of the south side, (Kim Jong Un) exchanged views and made a satisfactory agreement,” said Korean Central News Agency (KCNA) of the meeting that took place on Monday. Chung said at the Blue House on Monday before his departure that his team would deliver the South Korean president’s wish to bring about denuclearisation of the Korean peninsula and permanent peace. Both North Korea and the United States have said they are open to talks, but the U.S. position has been that dialogue must be aimed at North Korea’s denuclearisation, something Pyongyang has rejected.